Interested in booking Angele for one of her popular workshops exploring the connections between writing, creativity, dreaming big, and personal finance? Email her at angelemcquadeauthor@gmail.com for workshop details and availability. Sign up for Angele’s newsletter to be the first to hear about new classes, workshops, and speaking events. Can’t make it to one of her events in person? Check out Angele’s online classes! Angele is on a brief speaking hiatus while she finishes her next book, but she’s open to invitations for the second half of 2018. Join Angele for a special, expanded two-hour Cash & Creativity: How Cleaning Up Your Finances Can Spark New Creative Success master class. Join Angele for a special three-hour intensive, combining her popular Cash & Creativity: How Cleaning Up Your Finances Can Spark New Creative Success and a brand-new workshop all about navigating the business side of writing. Dream Big, Then Do Big! Cash & Creativity: How Cleaning Up Your Finances Can Spark New Creative Success, hosted by the Virginia Romance Writers (VRW) chapter of the Romance Writers of America (RWA), Glen Allen, VA.
Dream Big, Then Do Big! Join Angele for a fun, interactive session designed to help you uncover your deepest dreams and then create a plan to make them happen. Angele will be presenting Cash & Creativity: How Cleaning Up Your Finances Can Spark New Creative Success on Friday, July 15 at 11 a.m. as one of the workshops at RWA’s annual conference. Registration is now open – register early, as this national conference always sells out! May 9-29, 2016: Cash & Creativity: How Cleaning Up Your Finances Can Spark New Creative Success, a three-week, interactive online class for the YA chapter of the Romance Writers of America (RWA), open to all. May 20-22, 2016: Better Investing National Conference (BINC), Chantilly, VA Join Angele for the very first live Book Value book club discussion on Saturday, May 21, as well as an exclusive BINC-personalized version of her popular Cash & Creativity class on Sunday, May 22, all about how cleaning up your finances can re-energize your career and investing portfolio. More information about registration and BINC’s free, open-to-the-public Saturday sessions are now online. April 29-May 1, 2016: Washington Romance Writers 32nd Annual “In the Company of Writers” Retreat/Conference in Westminster, Maryland Angele is absolutely honored to be delivering the inspirational closing address at this year’s three-day event. January 9, 2016: Cash & Creativity: How Cleaning Up Your Finances Can Spark New Creative Success at the monthly meeting of the Washington Romance Writers (WRW) chapter of the Romance Writers of America (RWA). More information is available on WRW’s site. October 28 – December 2, 2015: NaNoWriMo: Let’s Do This! Whether you’re a National Novel Writing Month first-timer or a ten-time NaNoWriMo winner, come join NaNoWriMo success story Angele McQuade as she hosts YARWA’s high-energy, inspiration-filled online support group to help you turn your November novel writing goals into reality by writing 50,000 words in one month.This group is open to any and all writers–YARWA member or not–looking for a friendly, supportive environment that cheers them on while also providing daily accountability. This two-plus hour interactive workshop takes our exploration of the Three Act Story Structure to the extreme as we talk our way through an entire film. You’ll be able to observe (and practice identifying) the story elements we’ve been talking about over the arc of an entire story. You’ll also be introduced to more screenwriting tricks and tools that can help you bring more life to your own novel. 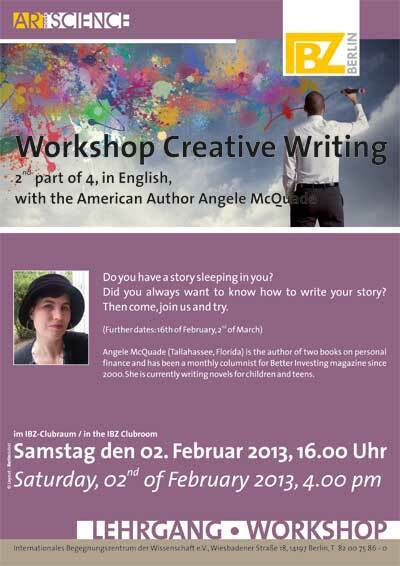 Come hear Angele’s talk What an American Author Loves About Living in Berlin , a part of the Rüdi-Net LESEFEST on Saturday, March 23rd, 2013 at the IBZ Clubraum, Wiesbadener Strasse 18 in the Rüdesheimer Platz neighborhood in Wilmersdorf, Berlin (U3: Rüdesheimer Platz). Angele will repeat her talk hourly at 16.00, 17.00, 18.00 and 19.00. Rumor has it there will be coffee and cake available, too! 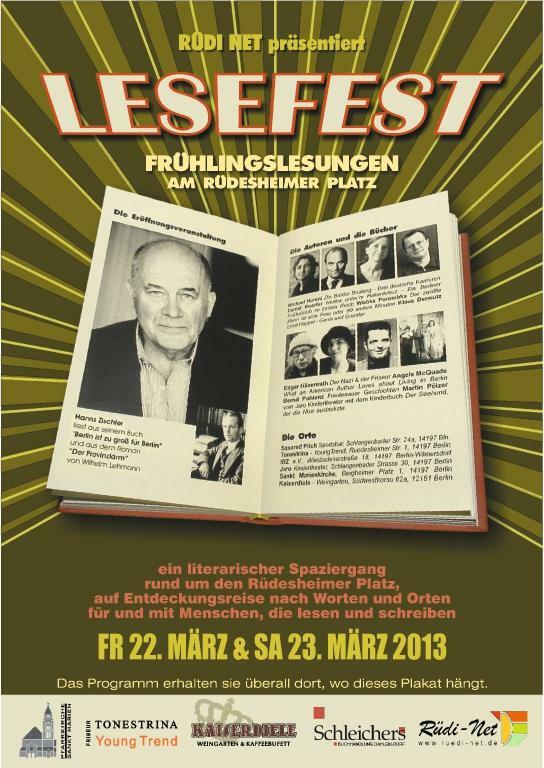 You can find a complete schedule, list of participating authors and many more details on the two-day LESEFEST here. Will 2013 be the year you finally write the book you know you have inside? Join American author Angele McQuade for a four-part series of interactive workshops designed to help you discover the kind of book you’d like to write and then set you on the path to start it. Whether you’re interested in writing for adults or children, fiction or non-fiction, essays or novels, Angele will help you uncover the ideas you’re most interested in and then learn how to begin to turn them into a book. 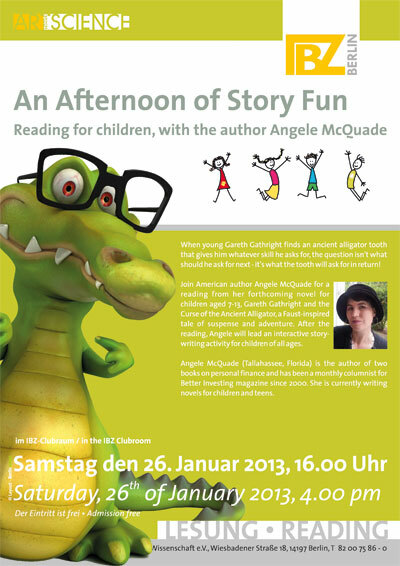 26 January 2013: An Afternoon of Story Fun for Young Readers and Writers! Join American author Angele McQuade for a reading from her in-progress children’s novel The Curse of the Ancient Alligator, a Faust-inspired tale of suspense and adventure. As a part of the reading, Angele will lead her young audience through an interactive (and sometimes silly!) introduction to some of the most essential elements of a page-turning story. Language: The reading and activities will be in English but readers and writers of any language will be warmly welcomed. Want to get book an event with Angele? Get in touch at angelemcquadeauthor@gmail.com. If you’d like to be added to Angele’s newsletter list to hear about new events as they’re announced, please sign up here. About Angele: Angele McQuade is the author of two non-fiction books, including Investment Clubs for Dummies, as well as novels for kids and young adults. She is the monthly Book Value columnist for Better Investing magazine, and has published almost three hundred reviews, profiles, features, cover stories, and other articles since 2000. 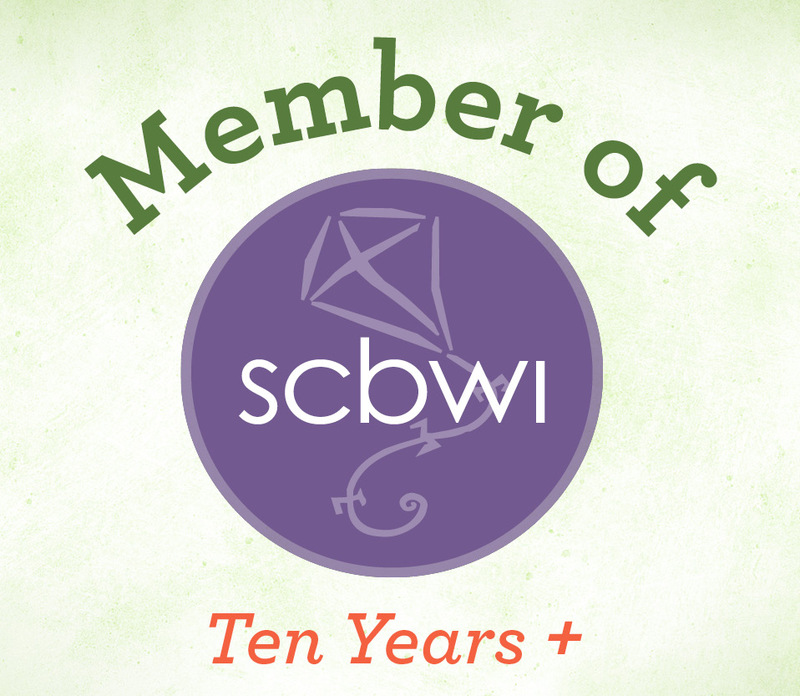 She is represented by Jennifer Laughran of the Andrea Brown Literary Agency.